What species is this bird? Can it actually mimic human speech, or are these sounds in the video its natural sounds? It is a black-collared starling (Gracupica nigricollis). 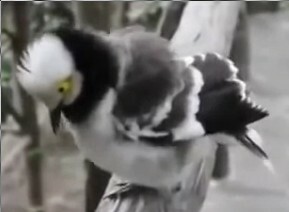 According to the title of this other video, which is the same footage uploaded by another user and could be the original one, it has been recorded in Thailand, where the black-collared starling is common. 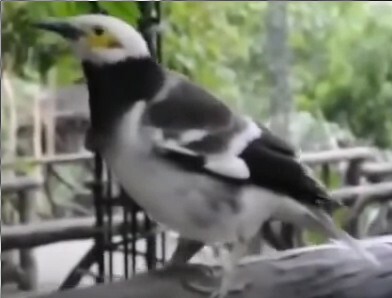 In Thailand the collared starling is sometimes kept in captivity and taught to speak. Not the answer you're looking for? Browse other questions tagged species-identification zoology ornithology or ask your own question. What is this crow eating, and is it a common part of the corvid diet? Do Asian koel males communicate through calls? What is this bird of prey? Is this a hawk, or an eagle?